Your house will instantly smell like fall with this Crockpot Apple Pie! Chopped apples topped with a Bisquick batter and brown sugar streusel! Didn’t know you could make apple pie in the slow cooker, did ya? You can, and it’s so easy! You’ll need 8 apples and Bisquick for this Crock-pot Apple Pie recipe – and I’ll bet you have all the rest of the ingredients already in your pantry. Use whatever apple is on sale! Seriously, I think we go off the deep end with being particular about which apple tastes best for which dessert. We’re adding all sorts of spices and sweetness to them; it really doesn’t matter which variety of apples you pick. How long does it take to cook in the Crock-pot? This recipe needs to cook 6 – 7 hours on low in the slow cooker to allow for the apples to soften enough. It isn’t recommended to cook it on the high setting on your Crock-pot because the edges will likely burn. Peel, core, and chop apples and toss them with cinnamon, nutmeg, and allspice. Dump them into the bottom of the Crock-pot. Whisk together milk, butter, eggs, vanilla, and Bisquick. Pour this batter over the apples – the batter will be lumpy! Using a pastry blender or two knives, mix Bisquick with brown sugar and cold butter until coarse crumbs form. You could also do this in a small food processor. Sprinkle the topping evenly over the apples and batter in the slow cooker. It will be done on low in about 6 – 7 hours. What should this apple pie be served with? You could certainly serve this plain, but it’s even better warm with some whipped cream or a scoop of vanilla ice cream! YUM! Make your own Bisquick! 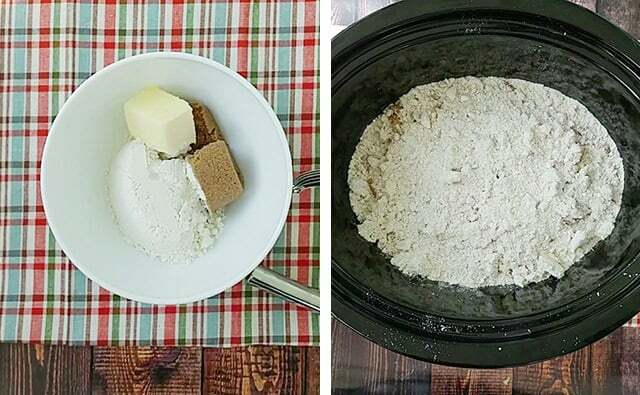 I have a tried and true recipe here for DIY Baking Mix which you can substitute for any recipe that calls for Bisquick – including this one! 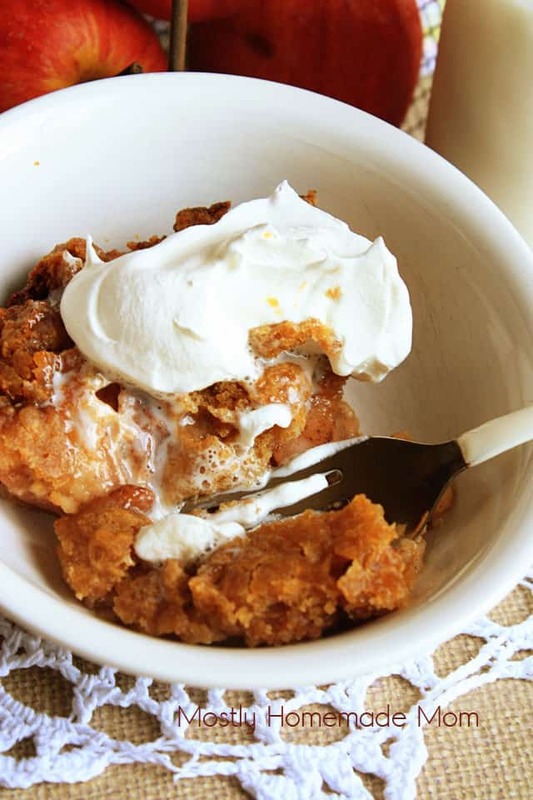 Homemade whipped cream would go amazingly on top of this apple pie! I recommend this recipe, it’s much easier than you think to make a homemade whipped cream. 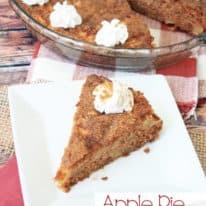 If you liked this recipe for Crock Pot Apple Pie, leave a rating and a comment below this post! 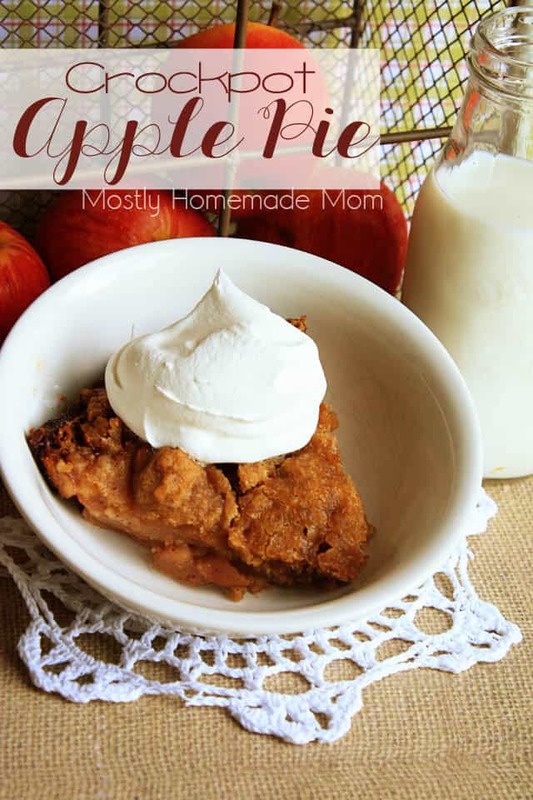 Your house will instantly smell like fall with this easy Crock-pot Apple Pie! Spiced apples topped with Bisquick and brown sugar, simple and so yummy! In the bottom of a large slow cooker, stir together the apples, cinnamon, allspice, and nutmeg. In a medium mixing bowl, whisk together milk, 2 tablespoons softened butter, sugar, eggs, vanilla, and 1/2 cup baking mix. Batter will be lumpy. Pour over apples. In a separate mixing bowl, stir together remaining 1 cup baking mix and brown sugar. 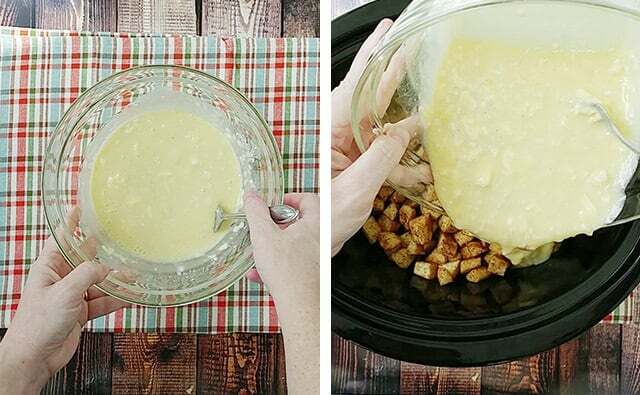 Using a pastry blender or two knives, cut in 3 tablespoons cold butter until evenly crumbly. Sprinkle over ingredients in Crock-pot. Cover and cook on low 6 – 7 hours or until apples are soft. Aw….your son is a cutie, Kelly. How old is he, if you don't mind me asking? My son, Hunter, is about to turn 2 years old (well, in November), and he's fast becoming my little helper around our home, as well. Lately, his big thing has been to help load the washer–and, he's getting pretty good at it, too! The way I see it, it never hurts getting them started helping around the home at an early age! 🙂 LOVE LOVE LOVE your blog, Kelly…nice work with it! 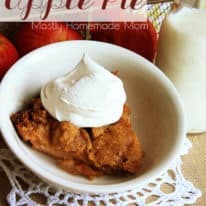 I would have NEVER thought to make apple pie in a crockpot, I love how easy that is! And your son is SO cute! Pinned! Looks delicious Kelly! 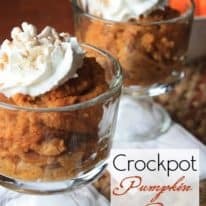 I love making dessert in my crockpot! Love this! I wondered what your secret was…that is exactly what I use! Oh. my. gosh! This pie is a MUST make!! This is fantastic! I never would have thought to do this in a crock pot. It might very well be my favorite dessert ever. It’s not overly sweet, which is part of why I love it so much. How many eggs should I use? Amount not stated in the recipe. Sorry about that, Judy! It’s 2 eggs and I added that to the ingredient list as well. 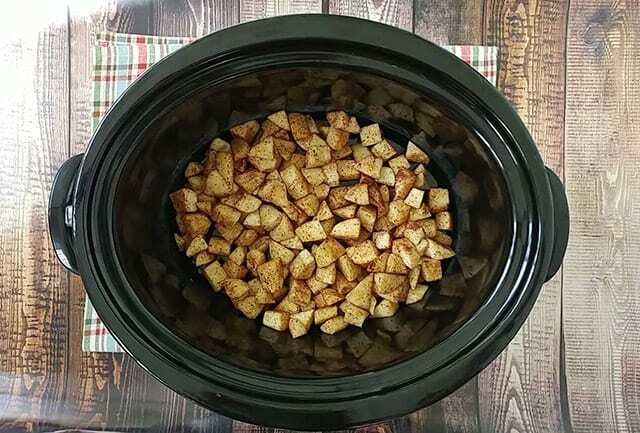 Hi – can I double this recipe if I have a large crockpot? Do you think this would work with cherryvor peach pie filling too? I think it would, though I’ve never tried it. Let me know how it turns out if you do!